Before we announce the winners of the 2010 My Theatre Awards, we’re proud to present the My Theatre Nominee Interview Series. 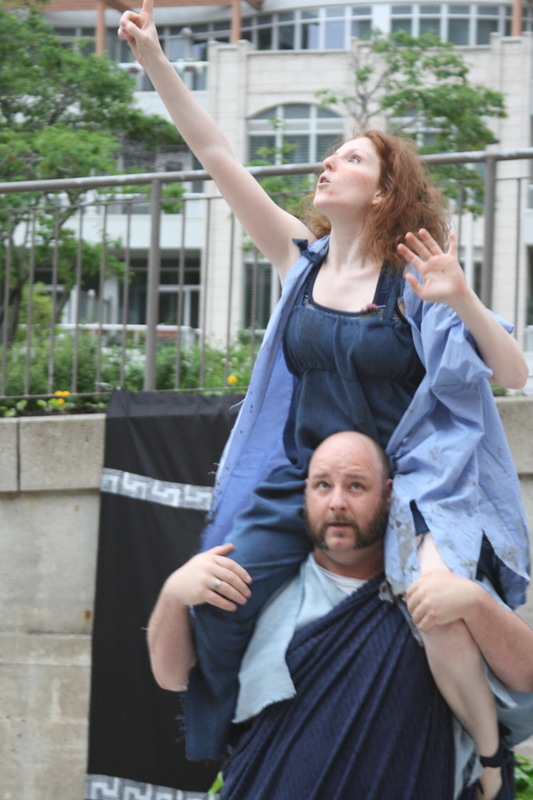 Toronto actress Adrianna Prosser gave one of the summer’s most memorable performances in Urban Bard’s production of Shakespeare’s obscure but fascinating Two Noble Kinsmen. As the tragically starry-eyed Jailer’s Daughter, Prosser was easily the highlight of the clever and innovative production, which is also nominated for Best Director (Scott Moyle) and Best Local/Independent Production. It was The Secret Garden at the Elgin I think – I was about 6? I remember loving the buzz of the people and how everyone was so happy afterwards like they all had a really good nap. Seeing I was hooked, my mom took me to everything she could and we ended up seeing Phantom at the Pantages. I wanted to be Christine Daae more than anything! My mother explained it was an actress who pretended to be Christine. “I’m going to do that too!” I was a goner by grade one. Where did you study/develop as an actress? I am a graduate of the joint UTM/Sheridan Specialist in Theatre and Drama Studies program. From there I took my Intermediate Stage Combatant Certificate with FDC and trained with The Toronto Circus School and Toronto Aerial Dance for a bit. I would love to do anything by Jason Robert Brown as I left my musical theatre roots when I fell hard for the Bard at University. I started acting as Anne in Anne of Green Gables the musical – I think JRB’s work is beautiful. That, and when I’m the right age Mrs. Lovett from Sweeny [Todd]. And of course Queen Margaret in all of the histories. To act her from the Henrys right up to Richard the Third would be a dream come true. The dream is to keep acting – that in itself would be a dream role. Richard Beaune was a fantastic director that helped me feel more comfortable with comedy and character work during Comedy of Errors. The fact that we call it a “play” is for a reason, so get out there and PLAY. That sense of play and fun has carried me a long way. Seeing Daniel MacIvor in his own show Monster was a huge turning point in my mind. After I fell in love with the one-man show structure and performance, I started to create my own. I have two historic based one-women’s that are featured at Gibson House Museum and soon to be another at Montgomery’s Inn. Favourite role was this one, Jailer’s Daughter, she is a fantastic character that takes you on a crazy journey – literally! She allows you to explore so much that it was, and continues to be, a dream role. Shakespearean ladies tend to be my top ten list of dream roles to play. Describe the rehearsal process for Two Noble Kinsmen. Scott Moyle and I both love Shakespeare and were both coming to Two Noble with years of anticipation. Scott was very generous and really let JD be of my own making. Right from the audition we just clicked; his direction was more like adding spice to a recipe as I had the foundation knowing the text well and every now and then he tweaked it and helped me see a new side of her that I hadn’t found on my own. We sat and talked out the lines on the park benches or at the Rich Tree patio and ran around the space as much as we could because it was raining a lot of the rehearsal time. Tell me about the Jailer’s Daughter. How did you approach the role? Did you do anything specific to prepare? Are there any key components that a great Jailer’s Daughter should have? I think every great Jailer’s Daughter should not be afraid of the clowning aspect of the role. She is, in fact, ridiculous – so embrace it and have fun! I came at her with that in mind and based her off of my Pochinko clown named “Annabelle Bonnebelle”. The clown work gave me a spring board into JD’s mannerisms and reactions. As she became more and more crazy she became more and more child-like in my opinion, which is why I married the Pochinko clowning to the role. How did the found-space, roaming aspect of the production affect your performance or the process? The outdoor performance coloured what JD had to be in the end: louder and perhaps a little louder in physicality as well due to the space. It also allowed for some great gags like the rope down the wall side – one of my favourite moments that would have been near to impossible in a theatre without the proper rigging. As well there was the non-audience member/College Park patron issue where I sometimes used a passerby as a character in the show. I acknowledged them and incorporated them into the show whenever the lines would let me – I could get away with it more than others in the cast because of Jailer’s Daughter’s “state of mind” as it were. Her crazy makes her, as most Shakespearean crazies, say and see what others don’t, so I used that to my advantage in this production. My one-woman show about the 1837 Rebellion of Upper Canada is a part of the Storytelling Festival here in Toronto: Rebellious Women: Teaspoons Raised is about the women who endured their men going to war with the government – so much is written about the men who fought but never about the families that were attached to them so I wanted to write their story. It goes up April 2 and 3rd at The Gibson House Museum. Please visit www.adrianna-prosser.com to see what else this fiery redhead is up to!